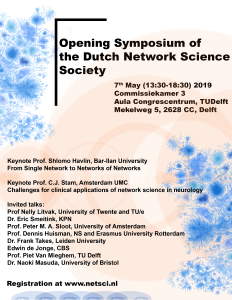 The Dutch Network Science Society is a society aimed at bringing together researchers in the Netherlands working on the topic of network science; the extraction of knowledge and insights from theoretical and empirical analysis of complex networks. On May 7 in the afternoon at TU Delft, the official opening of this event will take place, including invited lectures, pitches and networking opportunities. For details, see below. Please consider attending the event and register via the website: http://www.netsci.nl.